Is there such a thing as "Los Angeles Pizza"? If other cities gets a distinction, why poor ol' Angelenos down here never gets a special pizza? Many pizza lovers associated thin fold-able pizza as New York style. If you ever seen pizza stuffed with toppings and cheese in a pan like a shepherd's pie, we automatically assumed it as Chicago's style or Deep Dish, which again associated with that city. Fear not, we might actually have something for the City of Angels. 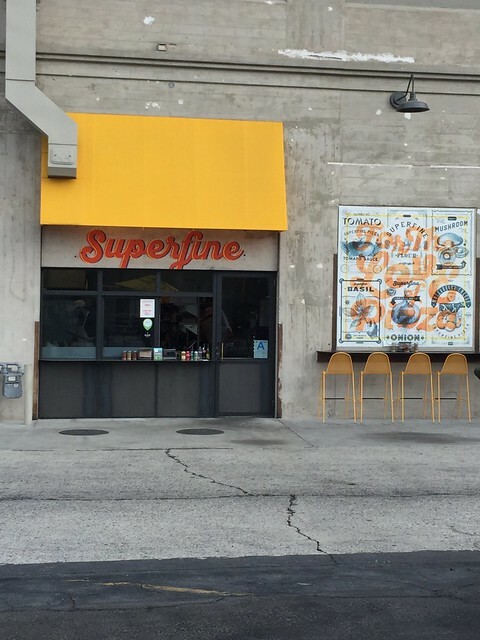 Superfine Pizza, from the fantastic team that gave us Angelenos some of the finer restaurants in Los Angeles such as Rossoblu and Sotto. Those two places already serves some of the finest Italian cuisine, which dazzles many fine dining crowd here. You can bet pizza will be one as well. If that's the case, why opened up another one in LA? More importantly, foot steps from their critically acclaimed winner Rossoblu? 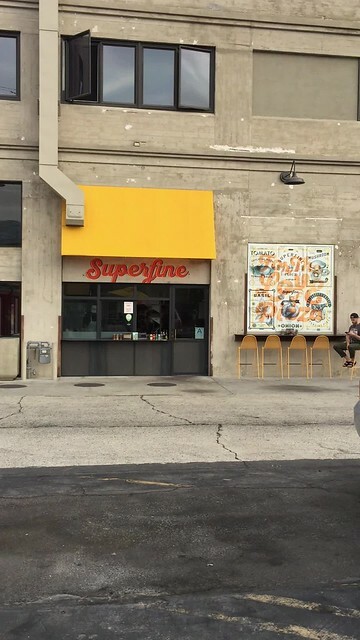 Oh, did I also mentioned in that Superfine is more of a take out window, than a sitdown restaurant? Several observations off that bat on my few visits. I noticed in that you can ordered a few ways. Either an entire 18 inch pie cut into slices or by the slice which average out to $4 each. If you are in big party or have major hunger, the 18 inch would be better deal. If you want to try one of each or just want to take photos of the entire collection, then be my guest on ordering per slice. Secondly, it's credit card only. Not saying most dining establishments are looking towards electronic payments over cold, hard cash. Based on what I read, it basically protect the place from carrying cash as they do opened towards late of the night. Not surprisingly, they do get the fallouts from people who just left the bars and cocktail lounges nearby. Pizza would be great to soak things up. To my initial thought, this place has something to offer that may give a distinction of a LA pizza. 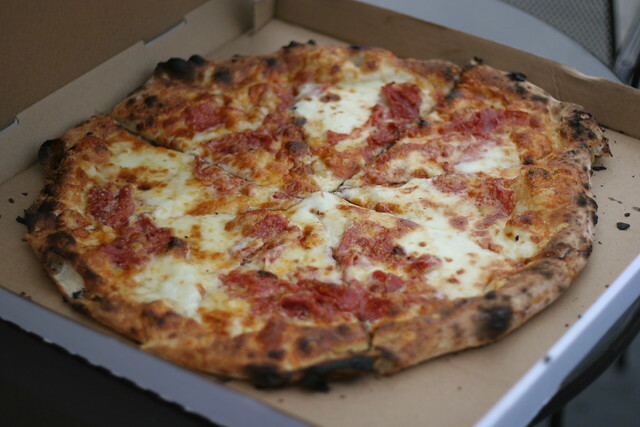 Initially Superfine named a combination of buckwheat honey and spicy salami as Spicy Honey Pizza. This pizza's two star attraction ingredients on top of provolone and Grana Padano cheese makes it an absurdly mouthwatering pizza. You have to imagine on how the crust is being appreciated. If you love a Neapolitan style dough, you definitely will love this. I have heard they might integrated other style pizzas. My best hunch was that a thinner crust will be easier and faster to churn out if the idea of fold-able pizza is in play for customer who are looking for something simple. So far, the menu are kept in manageable numbers of items with some sides in their repertoire. There are plenty of sodas selections in stock as well for that quench of thirst. Several thoughts on opening up a take out joint near there flagship would be the fact that the staff can be interchangeable.. for now. More importantly, I can see them opening something similar to this stand at other venues/food hall. This would be an easy cinch when it catches on. Here's one down of this Salami Honey pizza for LA. Spicy Honey is the bet for LA pizza. It may not be a square or fold-able, but it is spicy and sweet that we can't forget.